The ingredients in the pizza dough recipe determine how healthy or unhealthy the pizza is going to turn out. Just by adding a pinch of herbs you will authenticate the flavour and increase its benefits. Herbs are a great source of antioxidants and once dried because the concentration in dried herbs is greater than in fresh ones, since they no longer contain water. The herb oregano is great in pizza dough, homemade pizza sauce, salads or on a grilled cheese sandwich. Rosemary, paprika and basil all contain preventative nutrients and will enhance the flavour of any pizza as well as in many other dishes. Herbs are just as good as fruits and vegetables but in a lower quantity and in a more concentrated form. Also by simply changing the flour used in the base from plain to whole meal flour or to spelt flour you are significantly increasing its potential to become a healthier pizza dough. With using pizza dough you have an opportunity to create much more than a just a flat round pizza. You can make pizza pockets, pizza dough filled with your favourite filling, pizza scones, pizza roles or pizzettes just to name a few. These are all options of how you can use pizza dough to make various things for not only dinner and lunch but as a snack as well. Take one lot of the pizza dough recipe. Makes about 45 pieces. Preheat the oven to 190C°. Convert! With a rolling pin roll out the dough to about half a centimetre in thickness. Use a cookie cuter or tumbler to cut out the round shaped bases. Spread the discs onto a greased or baking paper lined tray. Brush them with olive oil. Layer one slice of tomato, then chopped fresh basil, topped with some grated mozzarella or some other hard cheese onto the small round base. 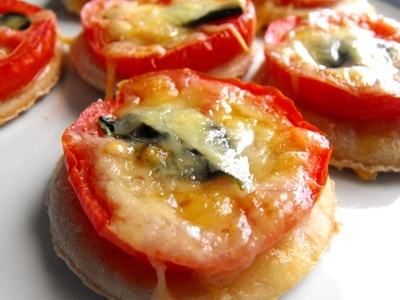 Bake the pizzettes at 190C° for 10-15 minutes. 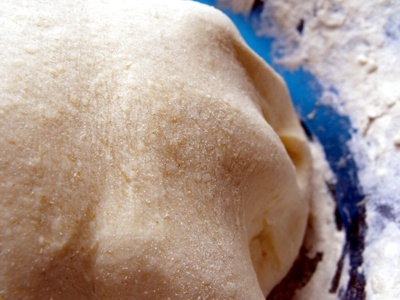 Making and topping, pizza dough is a great way to get the kids involved in the kitchen. Here are some of the pizza dough recipes that we use, to get you thinking about all the different options that are available. Tried and tested are wheat, wheat wholemeal, spelt, spelt wholemeal. Add extra flavour to a homemade pizza recipe (optional): rosemary, sage, oregano or your favourite flavour combination. Add the flour, olive oil and herbs (optional), salt (optional) together in a bowl. Make well in the middle. In the well add the yeast and water then leave the yeast to dissolve in the water for 10 minutes or some reaction is visible through bubbles on the surface. Then knead, add bid by bid water until you get a smooth round ball. Leave to rise in a warm place for about 1 -2 hours. Note: If the dough is too sticky add more flour until the right consistency is reached - smooth but without stickyness. Tried flour variations for healthy pizza dough: wholemeal wheat flour, wholemeal spelt flour, and 2/3 to 1/3 mixes with any of the below flours and millet flour and coconut flour. Gluten free variations: rice flour, buckwheat flour – add 1 tsp more yeast, besan (chickpea flour)- add approximately 1 tsp more yeast - does take longer to rise and rises not as much. Mix ingredients together leave to rise in a warm place for 6-12 hours. We love feedback. Skip to leave a comment about the pizza dough recipe. With our homemade kefir 6-8 hours proofed to be sufficient to rise decently. Do we need to keep it longer the fridge is the right place after that. Do you have a tasty pizza recipe? Share it in photo and word.